Scenic Mt. 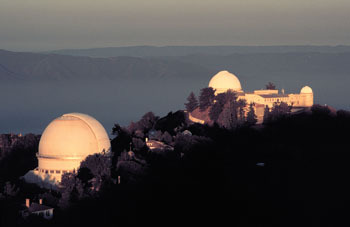 Hamilton is home to the Lick Observatory. Exotic plants, quiet library halls, Grateful Dead memorabilia, friendly sharks, and a gigantic set of whalebones greet visitors to UC Santa Cruz in the off-season when most students are away for the summer. Sure, it’s a bit sleepier than usual, and lots of the bustle has died down. But without the crowds, there is more room for contemplation and taking in the views. And parking will be a snap. Just walking around is a wonderful way to begin exploring the campus. But if you want an even better sense of this lovely, hilly, 2,000-acre university, its groundbreaking research, and its unique programs, reserve your spot on a 90-minute walking tour; the guided explorations run through the summer. While the study carrels and quiet rooms may be free of nervous students studying for finals, McHenry and the Science & Engineering libraries are both open to the public and pleasantly situated among towering redwoods. The summer session hours, which run through August 28, are from Monday through Thursday 8 a.m.–8 p.m., on Friday from 8 a.m–5 p.m., and Saturday and Sunday, (McHenry only) from 12 p.m.–5 p.m. Stroll the stacks and take in the forest views. And remember that the campus’s one-of-a-kind Grateful Dead exhibit—the Brittingham Family Foundation’s Dead Central Gallery on the second floor of McHenry Library, featuring Dead memorabilia, writings, fan art, and much more—is open during regular library hours. The materials come from UC Santa Cruz’s world-famous Grateful Dead Archive. If you’re in artistic frame of mind, check out UC Santa Cruz’s intimate on-campus art galleries such as the Mary Porter Sesnon Art Gallery and others. Work by renowned sculptor Coeleen Kiebert (M.S. psychology, ’80) will be presented in a two-day exhibit at the Eloise Pickard Smith Gallery on August 14 and 15 from 11 a.m.–7 p.m. both days. For the past four decades, Kiebert’s ceramic and bronze sculptures have been exhibited nationwide in museums and galleries. It is hard to imagine a gym with a more stunning, sweep-around view then the one you get at the futuristic-looking, 6,500-square-foot OPERS Wellness Center, which offers a fine selection of cardio and weight machines. Watch the Monterey Bay shimmer in the distance as you burn calories by the second. The OPERS complex is open Monday through Friday, 6:30 a.m.–7 p.m., and Saturday and Sunday from 10 a.m.–6 p.m. The facility is closed on July 4th weekend. The UC Santa Cruz OPERS Wellness program, which changed its name last year to UC Santa Cruz FitLife, is also available for non-students. By buying a facility usage membership card, or paying a day-use fee, community members have access to its recreation facilities, which include tennis, racquetball, and basketball courts; the wellness center; running track and playing fields; and a swimming pool. Enrollment is available online. Prices vary. For more information, call (831) 459-2531. Alumni Association members receive discounts on cards and day-use fees. Think the campus dining options dry up when the students take off? Think again. The convenient Global Village Café at McHenry Library is open Monday through Friday, 8 a.m.–5 p.m., and Saturday through Sunday, noon–5 p.m. (the café closes for the Independence Day holiday). Or if you are feeling insufficiently perky, you can always hit the PERK coffee bar at the Physical Sciences Building, open Monday through Friday from 8 a.m.–2 p.m., until September 1, and from September 8–18. It closes July 3 as well as from September 2–7. The coffee bar at University Center (located above Colleges Nine and Ten dining hall) is open through August 28, 8 a.m.–2 p.m. Monday through Friday. All these places are open to the general public. Other standbys including Banana Joe’s, College Eight Café, Cowell Coffee Shop, Crown/Merrill Dining Hall, Terra Fresca, and Oakes Café all close for the summer. Take a look at the online summer dining schedule for more specifics about these eateries as well as three college-affiliated cafeterias on campus, which are also open to the public—and keep in mind that hours are subject to change. If all these cultural explorations make you a little bit peckish, drive on up (or jump on your cruiser bike) to the UC Santa Cruz Farm & Garden’s market cart at the corner of Bay and High streets at the base of the UC Santa Cruz campus. The cart is open Tuesdays and Fridays from 12 noon–6 p.m., and features fresh, organic produce and flowers grown at the campus Farm & Garden. For more information, call (831) 459-3240 or email casfs@ucsc.edu. Read more about the Farm & Garden’s produce sales options. Drive up Empire Grade between the two entrances to campus to find the UC Santa Cruz Arboretum and its unrivaled collection of flora from California as well as the southern hemisphere. 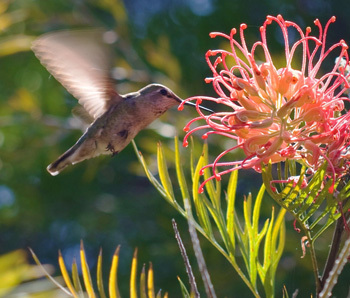 Summer is always a good time to enjoy the ocean breezes and watch hummingbirds zip through the air or stroll among the famous Australian rock garden. The Arboretum offers free admission on Community Day, which falls on the first Tuesday of every month. Visit the Arboretum’s website for directions or to schedule a docent-led group tour. Regular admission is $5 for adults, $2 for children, and free for UC Santa Cruz students and members of Friends of the UC Santa Cruz Arboretum. The Arboretum also offers a docent-led tour of its extensive gardens on the first Saturday of every month. Tours leave at 11 a.m. at Norrie’s Gift and Garden Shop. If you venture away from the main campus area and down to the coast, you will find another UC Santa Cruz satellite where hard-working marine researchers are delving into the mysteries of the deep. In certain circumstances, it would be highly inadvisable to pet a shark (for instance, while you are surfing off the coast of Santa Cruz and see a 20-foot great white hanging around). But the swell sharks at the Seymour Marine Discovery Center are mellow, and amenable to petting. Here in the center, volunteers will assist visitors and their young ones who wish to stroke one of these creatures. By the way, they’re called “swell sharks” not because they are excellent sharks—although they are—but for their tendency to gulp large amounts of water to make themselves swell up. The center is open from 10 a.m.–5 p.m., seven days a week in July and August, Tuesday through Sunday the rest of the year. Admission is $8 for adults, and $6 for students, seniors, and youth from 3 to 16. Children 2 and younger, members, and UC Santa Cruz undergraduates get in for free. For visitor information, call (831) 459-3800. If you’re looking for an extension of UC Santa Cruz that is even farther afield than the Seymour Center—and requires a trip “over the hill” to Silicon Valley, followed by a dramatic ascent of a peak—head out to the Lick Observatory on Mt. Hamilton, a state-of-the-art research facility for astronomers. The observatory is about 20 miles from downtown San Jose along Mt. Hamilton Road, which climbs to an elevation of 4,200 feet. The Gift Shop & Visitor Center is open Thursday through Sunday from 12 p.m.–5 p.m. year-round. Lick Observatory is also home to the ever-popular Music of the Spheres series—but keep in mind that these events sell out very quickly. For more information on the observatory, contact the Lick Observatory Guides Office/Gift Shop at (408) 274-5061 or giftshop@ucolick.org.